I love me a good farmer’s market. The sunshine, the local produce and artisanal goods, and the community feel all make me smile. As Jason and I have been going to farmer’s markets regularly for around 5 years we see huge potential for marketing. The only problem is that most of the vendors aren’t doing much marketing at all. 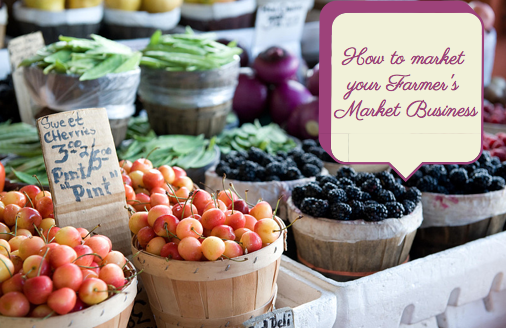 While this post is aimed towards farmer’s market vendors, all of these tips could be used for brick and mortar businesses, trade show businesses and festival or event businesses that are looking to engage, connect and sell to a local customer base. Here are some things you probably aren’t but could be doing better to grow your list and sell more products. List building is the most important aspect of your online marketing strategy. Honestly, without the list you may not get too far. Not only does the list allow you to sell products online, but your list also allows you to notify and remind your customers to come back and see you weekly. I’ve noticed that some vendors might have a piece of paper out and hope you will write your name on there. Let me be straight, most people won’t do it. They need a little push to get them to pick up that pen and give you their details. Yes, email is great. But for real-time marketing and selling at events, I’d even take it one step further and ask for phone number as well. Beyond doing this by paper, you can also do it by iPad and get people signing up right there and then on the spot. Or by texting a short-code to be added to the list. Once they text via short code also ask for their email. Boom, automation is a beautiful thing. Speaking of SMS or text messaging, it’s a great idea because it allows you to market to people on their phones while they are out. A quick sale notification or booth notification is all you need to let people know that you are at the market today and you have a certain sale. It’s important to stay top-of-mind. Because phones are so intimate you can get to people on the go and entice them in real-time. Giveaways and free samples are great at Farmer’s markets. If they like your product perhaps they’ll buy some. While giving away free samples of fruits and vegetables and even handmade and homemade goods works to get people buying right then and there, a different strategy could be used for those who are on the fence and not sure if they want to buy. Send them home with something to try at home, but if they take it they have to give you their email. Yes, much much better for you. This is reciprocation and it works. Now once they are at home and trying your product in a more private setting you have the ability to market to them also at home in a private setting through email. The regulars of the market probably live pretty close by. How about sending them some direct mailing to their home in snail mail. Yes, I said it. Snail mail. Of course you want to include an offer and encourage them to bring the postcard in order to receive it. Why not make them feel special and connect with your local audience in a new way. Because you can control where you send the mailing, you can also be sure that the people receiving the mailing are within a short walk or drive of the weekly market. Hello locals! Instagram and Snapchat are great tools for real-time marketing because they are mobile based. One step further and Instagram can also be local based. By tagging your photos to the farmer’s market location, you are adding to a community of people sharing there and searching there too. When you post instagram’s make sure you do it leading up to the event and at the event too. Tag your visitors and your customers to make sure that they get notified and start following you. Snapchat is great for sending flash sales and coupons. Plus since you’ve been collecting phone numbers (See above) you’ll have a better chance of growing your snapchat following.